"I never wanted to put this book down. The story was suspenseful and the writing imaginative." "...the story’s original characters, well-constructed plot, moving portrayal of teenaged angst and lust, and effective blending of genres should satisfy young adult readers looking for a fresh new fantasy series." Belle Fleur had never felt like home to Briz. Now it was less so. With Jaden still unconscious in the front seat of his car, he sped into town. Every pothole in the road grabbed at his tires. Most of the streetlights had been shot up by bored kids with hunting rifles. The few that remained gave off a faint glow and a crackling hum, as if they were prophesying what the night would bring. Briz was watchful, his attention skittering from one side of the road to the other. He was anticipating the creature from the black lagoon—or in this case, the mucky green bayou—to come charging at him. He swerved into the coffee-shop parking lot by the trailer. The light escaping from under the edge of Hubs’s curtains should have filled Briz with hope. Instead, doubt took hold. He meant to knock calmly on the hobbit-sized metal door, but his fist struck with force. There was no answer. He took in a sharp breath. Violet had said Hubs was the only chance for Jaden’s survival. Briz called out his name. With great effort, Briz stretched his lips into a crooked smile. Now what? What do I say to get him to help us? Normally when any kid Briz’s age approached Hubs, it was to play a joke on him. Briz’s saving grace was that he’d never been involved with their mean tricks. In fact, more than once, he’d called off some of his so-called school buddies and made them leave Hubs alone. He hoped Hubs remembered his good deeds. Hubs hesitantly followed him over to the car. The streetlight shone through the windows on Jaden. Her head hung limply, and foam dribbled from the sides of her mouth. 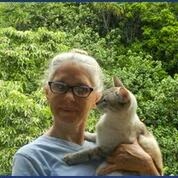 I live on an island in the middle of the Pacific Ocean with an artist, five cats and a parrot. 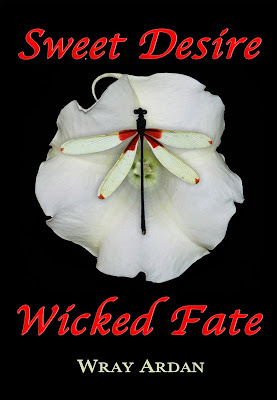 Sweet Desire, Wicked Fate was inspired by sculptures my partner in life and business, artist Steven Lee Smeltzer created. After all, our future lies in their hands. I apologize that my book list is incomplete. Over the past two years I've read 150+ books, but when I'm not reading, I'm working. Currently I'm writing bk 2 of Sweet Desire, Wicked Fate, and have obviously been a slacker when it comes to posting what I've read. Though as I'm playing catch-up on my list I have decided not to rate them. Just know that if I've posted it, I liked it and would rate it between a 3 & 5. I find it very hard to rate something that I know someone has put their time, heart, and soul into creating. Sounds like a good read and I love the cover! I enjoyed the excerpt and think the cover is great! love the cover, thanks for the chance!